All organisms on Earth require nitrogen to survive, but most cannot use nitrogen unless it is combined with other elements. These compounds are formed by the process known as nitrogen fixation, which can only be carried out in nature with the help of microorganisms. In agriculture, fertilizers are often deployed to supplement nitrogen levels in poor soil. In an effort to improve our understanding of how microbial nitrogen fixation works, two research teams, including DOE Joint Genome Institute scientists, collected samples from Tunisia and Argentina. Their results were published in Genome Announcements in July 2013. In these studies, researchers assembled draft genome sequences of two members of the Frankia genus which are known to be nitrogen-fixing plant symbionts. 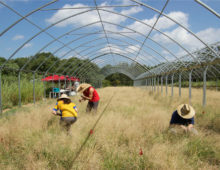 Researchers are investigating how ammonia-based compounds from nitrogen fixation are produced. Since some of the strains taken from Tunisia had adapted to dry, arid, high-saline environments, for example, researchers expect that these studies will inform strategies that enhance the productivity of soil to sustain plants in challenging landscapes. This information could prove to be a boon to desert or dry locations, where commercial application of natural nitrogen-fixing products could increase biomass feedstock yields for biofuels production. According to the USDA, farmers paid about $336 per short ton of nitrogen fertilizer in 2011 in the U.S. alone, amounting to a total cost of around $4.3 billion. Supplementing chemical fertilizer by harnessing microbial nitrogen-fixing processes holds promise for diminishing this expense.